We export silicone cables to Afghanistan, Albania, Algeria, American Samoa, Andorra, Angola, Anguilla , Argentina, Armenia, Aruba, Australia, Austria, Azerbaijan, Bahamas, Bahrain, Bangladesh, Barbados, Belarus, Belgium, Belize, Benin, Bermuda, Bhutan, Bolivia, Bosnia-Herzegovina, Botswana, Bouvet Island, Brazil, Brunei, Bulgaria, Burkina Faso, Burundi, Cambodia, Cameroon, Canada, Cape Verde, Cayman Islands, Central African Republic, Chad, Christmas Island, Cocos (Keeling) Islands, Colombia, Comoros, Congo, Congo, Costa Rica, Croatia, Cuba, Cyprus, Czech Republic, Denmark, Djibouti, Dominica, Dominican Republic, Ecuador, Egypt, El Salvador, Equatorial Guinea, Eritrea, Estonia, Ethiopia, Falkland Islands, Faroe Islands, Fiji, Finland, France, French Guiana, Gabon, Gambia, Georgia, Germany, Ghana, Gibraltar, Greece, Greenland, Grenada, Guadeloupe (French), Guam (USA), Guatemala, Guinea, Guinea Bissau, Guyana, Haiti, Holy See, Honduras, Hong Kong, Hungary, Iceland, India, Indonesia, Iran, Iraq, Ireland, Israel, Italy, Ivory Coast (Cote D`Ivoire), Jamaica, Japan, Jordan, Kazakhstan, Kenya, Kiribati, Kuwait, Kyrgyzstan, Laos, Latvia, Lebanon, Lesotho, Liberia, Libya, Liechtenstein, Lithuania, Luxembourg, Macau, Macedonia, Madagascar, Malawi, Malaysia, Maldives, Mali, Malta, Marshall Islands, Martinique (French), Mauritania, Mauritius, Mayotte, Mexico, Micronesia, Moldova, Monaco, Mongolia, Montenegro, Montserrat, Morocco, Mozambique, Myanmar, Namibia, Nauru, Nepal, Netherlands, Netherlands Antilles, New Caledonia (French), New Zealand, Nicaragua, Niger, Nigeria, Niue, Norfolk Island, North Korea, Northern Mariana Islands, Norway, Oman, Pakistan, Palau, Panama, Papua New Guinea, Paraguay, Peru, Philippines, Pitcairn Island, Poland, Polynesia (French), Portugal, Puerto Rico, Qatar, Russia, Rwanda, Saint Helena, Saint Kitts and Nevis, Saint Lucia, Saint Pierre and Miquelon, Samoa, San Marino, Saudi Arabia, Senegal, Serbia, Seychelles, Singapore, Slovakia, Slovenia, Solomon Islands, Somalia, South Africa , Taiwan, Tajikistan, Tanzania, Thailand, Togo, Tonga, Tunisia, Turkey, Turkmenistan, Tuvalu, Taiwan, Turkey, Vanuatu, Venezuela, Vietnam, Yemen, Zambia & Zimbabwe. We introduce ourselves as one of the noted manufacturer, trader, exporter and supplier of 11kv Silicone Cable. The best quality of raw material in a perfect ratio is used to manufacture our offered cables. These cables are precisely tested for tested conductivity, tensile strength by our dexterous professional which helped us to come up with such distinct range. These cables are available in full range of sizes and shapes at industry-leading prices. The company is a well-reckoned manufacturer, exporter, and supplier of 6 Awg Silicone Wire in india. Being elastomeric in nature, the silicone rubber cable is immensely flexible. These silicone rubber cables are used in various industries for diverse applications like ship motors, etc. We BHUWAL CABLES are considered to a most trusted named engaged in offering an extensive range of 6.6kv Silicone Cable. Using superior quality of raw materials and contemporary technologies these cables are manufactured. We have a team of well trained laborers who design these cables wires under the guidance of our professional experts. Our clients can avail these from us with various specifications that too at market leading rates. We are reckoned manufacturer and supplier of wide assortment of Silicon Wire. Our offered wire finds its application in electronic industries for making electronic appliances and tools. This wire is manufactured using optimum grade silicon with the help of high-tech techniques in compliance with set industry norms. Moreover, it is checked for its quality on series of quality parameters before being supplied to our clients. Clients can avail this wire from us at pocket friendly price. We design and check our Siliconcables according to ISI standards and the market guidelines. Our products have captured the market due to properties of weather resistance, ozone resistance, corona resistance, oil and chemical resistance, water resistance, heat resistance and radiation resistance. These special properties have enhanced their demand and they are highly desired and used by the defence forces, ship building industry, railways, offshore platforms, mining industry, nuclear power plants and other industries. We are reckoned manufacturer and supplier of wide assortment of Silicone High Voltage Wire. Our offered wire finds its application in electronic industries for making electronic appliances and tools. This wire is manufactured using optimum grade silicon with the help of high-tech techniques in compliance with set industry norms. Moreover, it is checked for its quality on series of quality parameters before being supplied to our clients. Clients can avail this wire from us at pocket friendly price. A range of single core and multicore cables for temperatures ranging from -190°C to +1565°C. Suitable for use in foundaries, bakeries, glass and ceramics factories. 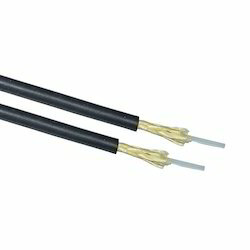 These silicone rubber sheathed cable can be installed where temperature ranges are widely variable. Like other cables in the range it performs extremely well under fire conditions, being halogen free and low in smoke, a flexible and durable cable, resistant to many chemicals and adverse climatic conditions. Silicone insulated conductors offer you an economical solution to many temperature related wiring problems. Capable of working at extremes as far apart as -50°C right up to +180°C, silicone insulated cables have grown substantially in popularity. Flexibility is retained even at very low temperatures where conventional rubber or PVC cable would become brittle and crack. At high temperatures the cable performs normally. In the case of a fire, the silicone changes to form an insulating layer of SiO2 which, provided there is no movement, will maintain cable integrity in the short term. This is important in the event of a fire where equipment needs to be shut down, lighting maintained and alarm systems remain operational. Silicone is relatively inert, that is to say it gives off minimal smoke or fumes when exposed to fire. Airports, hospitals, and other public buildings use silicone cables to wire alarm, lighting, and other essential services. At high temperatures, applications include heating elements, lighting, manufacturing and food processing and for control circuits where heat is involved. At low temperatures silicone insulated cables are used in cold stores and refrigeration plants for lighting, portable equipment and motor feeds. Constructions : SiF Fine tinned copper wire strands, class 5, silicone insulation. SiD Fine tinned copper wire strands, class 1, silicone insulation. SiF-GL Fine tinned copper wire strands, class 5, silicone insulation. Impregnated glass fibre braid. Various colours. SiF-HT Flexible tinned copper wire strands, class 5, silicone high voltage insulation. SiF-G-Si-HT Flexible tinned copper wire strands, class 5, silicone high voltage insulation, glass fibre braid, blue silicone sheath. We are counted amongst the one of the trusted names engaged in offering an assortment of Silicone Cables with High Voltage. These are manufactured using superior quality silicon with the involved of our well trained laborers. Before the delivery of our products these are tested on various parameters under the guidance of the professional team. Our clients can purchase these from us at market leading rates.